Welcome to my Healthy Living Series. Ever since my recent miscarriage, I have been trying to focus on rebuilding my health. I ended up with infection, then a D&C (minor surgery) and spent the 2 weeks after my surgery recovering. My doctor didn't allow me to do much physical activity while I was recovering. When all was said and done, I felt weak and tired. I am sure some of my fatigue came from the emotional toll that the miscarriage took. I do know that the weakness and some of the fatigue occurred because I had lost a lot of my physical strength. I made a "Get Healthy" plan and started to implement it. I am basing this series on my "plan" and my own experiences with it. 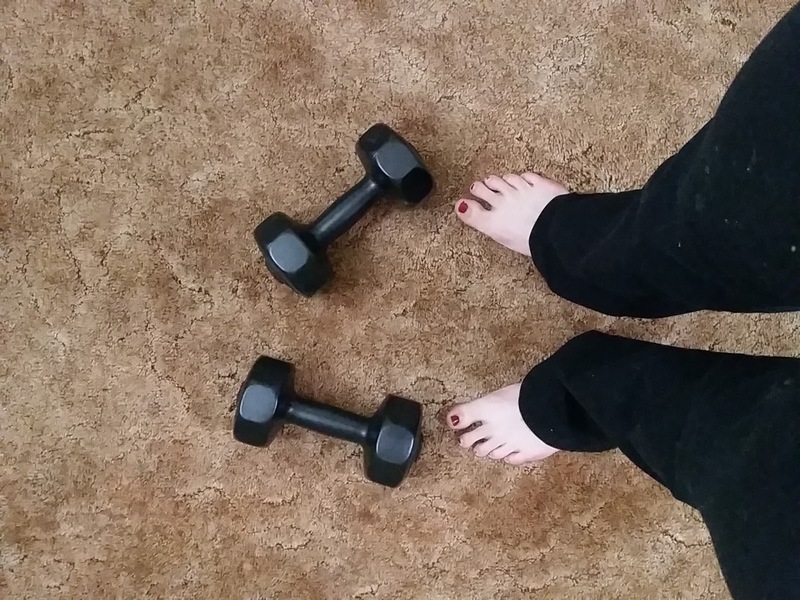 I am starting the series with Exercise. It is the first thing that I started implementing with my "Get Healthy" plan. I have always been an active person. I am not athletic, by any means, but I believe in the importance of fitness. Cardio activity is good for your heart and strength training is extremely important for your bone health. I find that being fit makes my day to day life easier. At home, I am able to chase and lift my toddler when I am fit. I can do my work much more efficiently because I have energy. If you are new to exercise, I suggest starting with walking. It is a low impact exercise with huge health benefits. All you really need is a good pair of shoes. I love to walk. I walk my dog and push the stroller. I like to walk with Miss. E and go on "adventures". After I had been cleared for working out, I started my current exercise program. I use Briana's Bikini Body Mommy workouts. I am currently doing the Bikini Body Mommy Challenge 4.0. I like that the workouts are short (15 minutes-ish), challenging and free. I access my workouts on YouTube. I have been doing the workouts for a few weeks and I am already seeing results, which is great! I am able to lift and carry Miss. E for longer, now. She is getting heavy and I wasn't able to hold her for very long before. I also have better energy, which is so beneficial for both my work and home life! Another benefit of exercise is the boost to my mental health. Exercise releases endorphins, which are "feel-good" hormones. I have always had a great mental benefit from exercise. It is my most important reason for exercising. I always feel better after a workout or a walk. If you are stressed out or feeling down, exercise can help. What are your favourite ways to work out? What are your favourite benefits? So sorry to hear about your miscarriage. Something like that takes such a huge strain on every part of your life. It's good to be getting back into exercise though. I know when I had my wisdom teeth out (in two sessions spread over a month) the thought of moving my body was horrendous but once I started I couldn't believe how good I felt. Looking forward to the next post in the series. Thanks, Debra! It does feel good to get moving again!